I’m past the halfway point on my Saigon book writing blitz – with some great new material and a headache. I’m still trying to wrap my brain around what I’m doing. 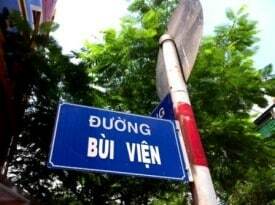 My original, loosely defined plan (which is still my loosely defined plan) was to write about life around Bui Vien Street – ground zero for Saigon budget tourism. Part of me feels sheepish about choosing this particular topic. When I travel, I usually try to escape these heavily touristed areas and find places outside the backpacker zone. 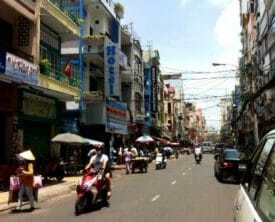 But this is my tenth trip to Vietnam since 2008 and, for better or worse, this neighborhood has always intrigued me. Scratching beneath the surface of this neighborhood is complicated. Some residents tell me the area is more dangerous today than it was ten years ago. Others say it’s safer. The most dramatic, rich-in-detail stories about local mafia come from tourists who speak with airs of excessive confidence and intoxication. And when I talk to local residents, I sometimes know the tales they are telling are only part of the story. A British tarot card reader told Kattina, on our visit six weeks ago, our marriage is firmly intact but we can expect financial upheaval this year. A few nights ago, I learned this fortune teller is living in one of the neighborhood’s cheapest, sketchiest hotels, and she’s behind on her rent because she has no money. Ummm… shouldn’t someone who predicts the future for a living know how to avoid such situations? A 22-year-old bartender speaks five languages fluently. She works 12 hours a day, seven days a week, for around US $250 per month. Her dream is to be an interpreter, but she has no college education, no time to job-hunt, and can’t afford cab fare to parts of town where she might find such jobs. An American in his mid-40s approaches me at one of my usual sidewalk café hangouts. He does not recall meeting me at a different one of my usual sidewalk café hangouts six weeks ago – because he was stoned out of his mind then. He is stoned out of his mind now too. The problem with Saigon, he tells me, is it’s not like Bogota, which has much easier access to cocaine. So every morning, all he can do is smoke a ton of pot and slam two glasses of strong Vietnamese iced coffee before going to work. He teaches English at a local kindergarten. My friend, Phúc, translates as I interview people around the neighborhood. 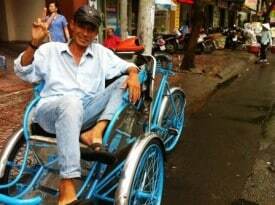 On Phúc’s motorbike, we pull up beside a cyclo driver. These bicycles with seats in front, once a popular method of transport for people who live here, are now used predominantly by tourists. Many cyclo drivers, I’ve been told, were forced into their jobs after the war. If they sided with the pro-US, South Vietnamese army, they had few other work options. But this guy insists he started riding cyclos by choice more than 20 years ago. He loves his job, he says. And while people might say they love their job for all sorts of reasons, even if it’s not true, his body language suggests he is sincere. There are powerful stories around here. Some are hilarious. Some are infuriating. Some are out in the open. Some lie hidden behind other faux-stories. Those hidden ones, the ones with different realities from what lies at the surface, are the ones intimidating me. I’m a humor writer, not an investigative journalist. I’m a curious guy who wants to know the full spectrum of what’s going on, but I’m also a smart enough guy to know not to go snooping too deeply in sketchier issues. I feel overwhelmed at times by all of this. But that is how one should feel in this neighborhood. It’s part of the thrill. So all is well.